As parents, we’re on the lookout for things that might harm our kids. It’s instinctive to annihilate dangers in their path: germs, foods additives, diseases, preservatives, and a steady diet of sugar. I’m pretty sure Stephanie and I will give our future grandkids plenty of cookies and ice cream, but right now it drives us crazy when the grandparents hand out candy. Like families of faith, we try to protect our children from worldly culture (don’t listen to that music… don’t watch that show). And we’re good at sin management, too (don’t lie, don’t talk back, don’t engage in such and such behavior…). What if there was something causing harm to our children’s faith? Often, without realizing it, we’re not as protecting in the area of faith. We should be helping our children understand biblical truth. The growing epidemic today is Biblical illiteracy. This might sound as interesting as the national debt. The problem is, we’ve not connected this epidemic (biblical illiteracy) to the bigger outcome: kids walking away from faith. Instead, we blame that on culture, weak church models, ineffective youth ministry, college professors, government, and the entertainment industry. It’s time we recognize the connection–and get serious in protecting our kids. The battle being waged today is for truth. The traditional evangelical view is that the Bible is the authority for truth. The emerging view is one of moral relativism. Truth is relative; you determine your own truth. Bible college professors say that each incoming freshman class knows basically less about the Bible than the class before. Christian school teachers say the same. Regardless of the study or the method for understanding biblical literacy, the conclusion is the same. Biblical literacy is in decline. Bible access is at unprecedented highs, thanks to smart phones. In other words, don’t be fooled into thinking that because your kids have a Bible app and a youth group they are rooted in faith. It’s not an abrupt rebellious shift that happens one day in college. It’s a slow fade. And it starts with lackadaisical treatment of God’s word in the home. A strategy? Huh. I never thought of it that way. How about you? The word strategy changes the conversation. I could ask, Do you exercise? Do you eat healthy? or I could ask, What is your strategy for maintaining good health? Do you have a strategy for instilling truth in your home? What is it… exactly? It’s harder to walk away from something than it is to walk toward something. Many kids today are not walking away from solid faith. They’ve simply not been grounded in truth, so it’s an easy walk toward moral relativism, false faith, and humanism. They’re not rejecting faith as much as they’re selecting something else. If you give your family something to own, something to claim, it will be harder for them to walk toward something else. This doesn’t mean they wont have questions, doubts, and seasons where faith is tested. But they’ll be better equipped to survive those seasons if they have a strong root system. 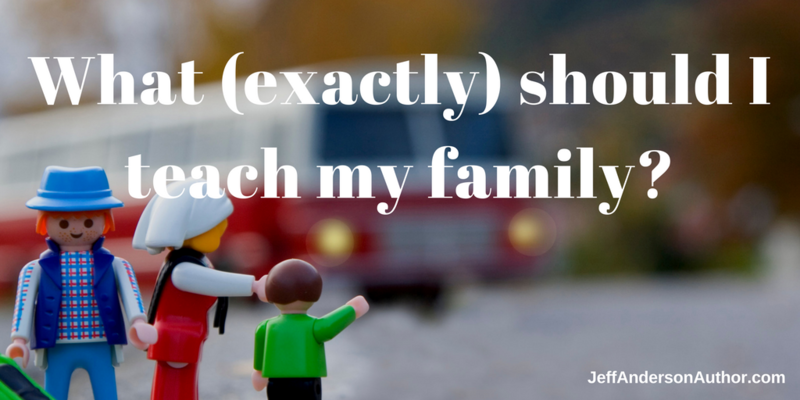 I want to share a five-part strategy on (exactly) how to lead your family into a deeply rooted, literate, faith. Specifically, I want to share five pillars of truth that can help your children avoid being among the growing community of biblically illiterate youth. It’s simpler than you think. Stay tuned here, or subscribe to my newsletter to receive the next posts!